Open up the worksheet you would like to set up a scheduled email for. Click the ‘…’ on the top right of the screen. Choose the frequency and time of day to send the emails, and who to send the emails to. Choose whether to run the queries for the schedule as the recipient. When this option is chosen, the scheduled reports can only be sent to Sigma users, and the user will only see the data they have access to in Sigma. If you can edit the dashboard, then you'll click the down arrow next to the Edit button. Choose whether to run the queries for the schedule as the recipient. 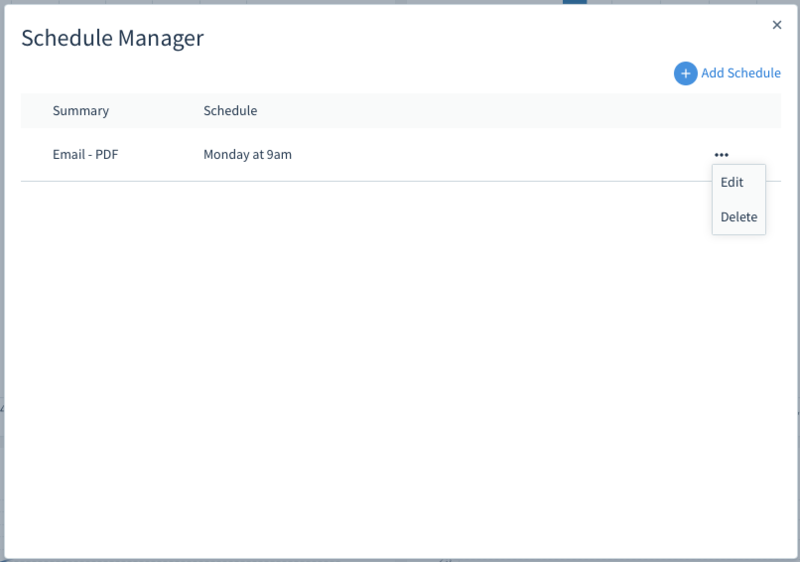 When this option is chosen, the scheduled reports can only be sent to Sigma users, and the user will only see the data they have access to in Sigma. Choosing this option will maintain any row-level security that you have set up for the dashboard. Click the '...' to the right of the schedule you would like to edit. Click 'Delete' to delete the schedule, and click 'Edit' to make changes to the schedule.